Now all he needs is someone with the hobby of web design, and he could make that site actually presentable. He claims that NYC has a LOT/PALM opposition. I find that pretty surprising: I myself have, and I hear around me, LOT=PALM. I first learnt English in Northern New Jersey just across from NYC, but since then my English has absorbed so many disparate influences from all over the world that it no longer sounds purely American. But when I once took one of those 'Which American accent do you have?' quizzes, to my surprise it came out as 'Northeast', with North Jersey as the first place listed, and with an accuracy of 100%, no less. I myself do have the LOT/PALM opposition, but I'm not entirely sure whether this is a feature of the North Jersey accent I took on or a product of learning English as a second language (and of course later being exposed to non-North-American accents). On the other hand, I can say with certainty that the North Jersey accent as I learnt it absolutely did not have the COT-CAUGHT merger. 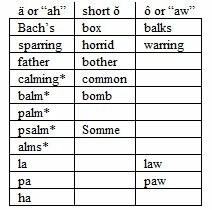 In any case, I think that although many aspects of my personal accent have changed, the vowel categories themselves have remained quite stable from when I first learnt the language. I find it a shame that he doesn't mark southwesatern Louisiana separately, as Cajun English differs considerably from general southern and is widespread even among those who no longer speak Cajun French. Also - maybe someone should contact him directly and explain the problem using the Heritage system and that IPA would be much better? The map claims that "Canadian raising" (raising of the starting-points of the MOUTH and PRICE vowels before voiceless consonants) is restricted to Canada and the Tidewater South. However, I have heard it in the speech of many Americans from New England, and even some from New York. I find it hard to read Aschmann's site on my Mac -- whether using Safari or Firefox. I've tried changing the Text Encoding, but nothing works. Can anybody advise me? VP, as far as I can tell it only claims that Canadian raising of MOUTH is restricted to Canada and the Tidewater South, which is as far as I know mostly true. Raising of PRICE, as you note, exists in many parts of the US (in some cases so advanced as to create a phonemic split), but I think substantial raising of MOUTH is a lot rarer. @John Cowan and Jongseong: I remember reading a claim (somewhere, by someone) that the LOT-PALM opposition was maintained by some speakers in the NYC area, with a suggestion that the phonetic values may have even switched, with [ɑ] in LOT and [ɒ] in PALM. I have no idea if that's true, although I have heard New Yorkers use [ɒ]. Myself, I'm from central Massachusetts - I distinguish LOT and PALM, but I merge LOT and THOUGHT. @AJD: Canadian Raising of MOUTH is definitely present here in Massachusetts; I've got it myself, and I've heard it from many other people here. Though whether it's predominant, I'm not sure. As for New York City, personally I (third-generation native) have a complete LOT/PALM merger, but I'm aware of a range of "backness" in LOT/PALM here, and I can't state with absolute certainty that no New Yorkers have a split. I certainly haven't noticed one before; now I expect I'll find myself listening for a split. @AJD: The raising of MOUTH is rarer, but I do hear it quite often from northern New Englanders (especially Bostonites) and also from Wisconsinites, Minnesotans, and North Dakotans (maybe Yoopers do it too). But that wouldn't make up a very large percentage of Americans, so overall I concur. As cool as this map is though, it seems that the guy who made it picked and chose who he thought best represented each area linguistically. I think a LOT/PALM split is more obvious among non-rhotic New Yorkers than among those who are rhotic (and nowadays a lot of New Yorkers are rhotic). A non-rhotic New Yorker will pronounce Clark [klɑːk] or [klɑək], and it won't be homophonous with clock [klɑk]. Palm itself isn't a particularly good word to test for as so many people pronounce with the /l/ and shorten the vowel before it concomitantly. "The mistaken impression that IPA notation is phonetic rather than phonemic" is unfortunately very widespread. It's one of the chief recurrent objections to using IPA to represent a pandialectal transcription of English at Wikipedia, alongside the ignorant and offensive mantra of "Statistically speaking, no one uses the IPA and no one understands it". A nit I would like to pick is that the distinction between "North Central" and "Western North" seems to have disappeared among us younger speakers (I'm 24) here in the Upper-Midwestern US. I grew up in a rural area just west of Fargo, North Dakota and am, as expected, Caught-Cot and Dawn-Don merged, and I monophthongize /eɪ/ and /oʊ/ to [eː] and [oː]. But, my peers and I ALSO have the initial stages of the Northern Cities Vowel Shift. I raise /æ/ to [ɛə̯], fronted /ɑ/ to a central [a], and back /ʌ/ towards where /ɔ/ used to be. Also among us younger speakers here I have noticed an increasingly strong tendency to vocalize coda /ɫ/* to something like [ɰ], as well as to back /ɻ/ to what sounds like the Uvular Approximant [ʁ] after back vowels! This must be very recent because I have seen no reference to it is stuff I've read on American dialects. *Note that I have dark L in all environments. I too am from Northern New Jersey, and thus rhotic. Hello folks! The map is mine. I’m glad many of you like it. I am a professional linguist: This map is a hobby because it has nothing to do with my regular work, which involves other languages, not English. However, I certainly am neither a cartographer nor a web designer, so useful suggestions on making the map and web page clearer are welcome. In these areas I am definitely just a hobbyist! Part of the problem is simply that the subject is very complex, and that I am determined to keep everything on one map (which a number have said they are glad to have). Why do I not use IPA? Because this map is for everyone, not just for linguists, and most Americans are much more familiar with dictionary pronunciation guides than they are with the IPA. What American English dictionary, intended for Americans, uses the IPA? Also, as its name states, the IPA is a phonetic alphabet! The “short o” vowel, as in /pǒt/, is pronounced [pat] (ignoring the aspiration on the p) by many in the Inland North, with a front vowel, but as [pɔt] by the English, with a back rounded vowel. (I hope those IPA symbols come out right on the web page.) The entire gamut of possibilities in between occurs somewhere in North America. But to the average English speaker from anywhere, this word has a “short o”, and the dictionary system appeals to this layman’s impression. Of course, with the merger of ä, ǒ and ô in much of North America, the choice of which symbol to use is a problem, but that same problem must be faced by any phonemic representation. If anyone can convince me that most laymen understand the IPA symbols better than the guide in the dictionary on their bookshelf, then I will consider switching. What we find in New York City, probably mostly with non-rhotic speakers, but also with some rhotic speakers, is a bother/father distinction, which matches the clock/Clark distinction mentioned by Tonio Green. In other words, for non-rhotic speakers father=farther. However, I have clearly heard this pronunciation of father from some rhotic speakers also. These are indeed phonetically reversed from the Boston pronunciation. Providence, which is in between, merges both of these pairs. Taylor Selseth: The difference between North Central and Western North is strictly whether they have the cot/caught merger or not, not any of the other things you mentioned. You come from near Fargo, so you merge them. The other features you mention may be bleeding westward, of course. As for the raising of “mouth” in New England, and parts of the North, I have heard it a bit, but I don’t think they raise “mouth” significantly higher than “loud” (which is the critical question here), and I don’t think they raise “mouth” as much as Canadians or Tidewater do. For Pittsburgh area, you might consider watching this video. It might seem like a joke but I assure you that Picksburghers really do talk like that, n'at. Here is a pure Houstonian! Lynn Wyatt!